I am in need of new jeans. Desperate need. The last pair I made are starting to wear through all across the top of the thigh at the back. Sniff. Unfortunately the pair I started after that have achieved the dreaded WIP status, mainly due to the metallic denim I chose being a pig to work with, and I’m struggling to find the sewjo to get back to them. But never fear, I have hatched a plan with my online sewing buddy Amy to sew jeans together, group motivation and all that. We’re planning to share lots of moral support, fitting trials and tribulations, tips and all that over on the Sew Alongs and Sewing Contests facebook group with an informal sew a long from Oct 14th – Nov 24th (which is when they celebrate Thanksgiving in the USA, seemed like as good a time as any to try and finish jeans for). This is quite an ad hoc, informal sew along, so unlike some of the sew alongs there, the only prize on offer is a finished pair of jeans, but if that sounds like motivation enough you’re welcome to join us! 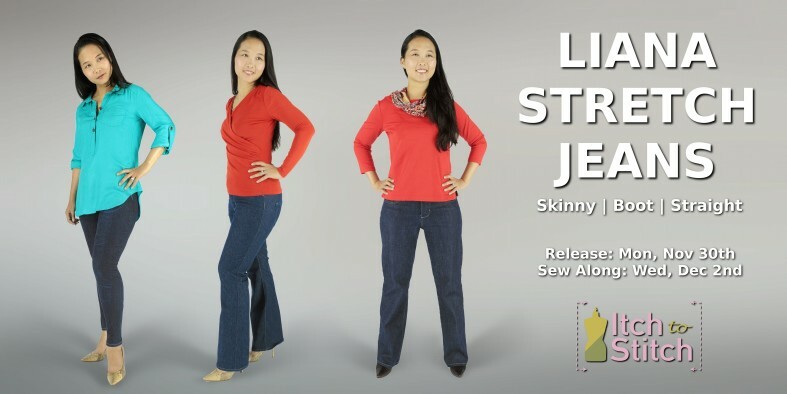 First up, the Liana jeans from Itch to Stitch, which have a previously featured as a sew along on the face book page you can still see all the blog posts that Kennis wrote. I didn’t join in first time around, but I was so impressed by the great jeans I saw made then that I have since made my own pair. This pattern recommends 25% stretch denim, which I’ve been struggling to buy. I did find some, but clearly the quality wasn’t that great as it’s wearing through, so I’m contemplating using a different pattern this time. But rest assured, as soon as I get a decent source of stretchy enough denim I’m making this pattern again. One pattern I’m considering is the Morgan jeans, from closet case files as they’re designed for non stretchy denim (and I have some really nice denim I bought online which turned out to not be as stretchy as I thought from the description). Of course, we also need to mention Morgan’s older, skinnier, stretchier sister Ginger for which there is also a series of handy sew a long posts written up. Then again, I’ve been recommended the Mimi G Simpicity jeans pattern which has slim/average/curvy fit options provided in the pattern and a you tube sew a long, as long as I can find that elusive 25% stretch denim. Fancy something a little different, how about the Named Jamie Jeans with their vertical seam up the trouser front and the cute pockets. Indiesew have sew a long posts on their blog to help you out too. Or how about the Cake Endevour Trousers made up in denim, like here? After all, jeans are just trousers made from denim. So I maybe I could finally use the Sewaholic Thurlow trouser pattern I bought a while ago. After all, I made these Juniper’s from Colette in a mad stripey denim from ikea (still going srong but looking a little shabby from where the cat stropped them). Or maybe I could make another iteration of Ottobre pattern, shown here in their foxy iteration. Then again, I could get a copy of the Vado jeans patern custom made to my measurements at Boot strap fashion and follow Kelly’s sew a long posts. Decisions decisions. It’s going to be hard to pick a pattern. Which is a shame as the sooner I start the process the more organised I’m likely to be and if I get really organised I might try and hack a pair to be more suitable for cycling like Melissa at fehrtrade has done here. So, to recap, you can join in if you’ve always wanted to make jeans but were too scared, have made them 30 times before, or anywhere in between. You can make them from scratch or finish a WIP. You can use a brand new pattern you’ve never tried before or an old favourite.Use a”proper” jeans pattern, or a normal trouser/pants pattern, or even something you’ve drated yourself. You can use stretch denim, or non stretch denim, or even not denim at all. We aim to start on 14 Oct but eager beavers are welcome to get going before then and we will always tolerate stragglers. Fitting advice, design dilema’s and general encouragement on the facebook group (I’m no expert, I have made about 5 pairs of jeans before, but I generally find there’s someone there who will know the answer to your questions), however you don’t need to be a member to take part. Hopefully we will all have new jeans to wear at Thanksgiving (even if you, like me, don’t live in the states and will be the only person on your street to realise it even is Thanksgiving). Or the day after thanksgiving, if you like to look a little smarter on the day itself. So, happy jeans planning. And if your favourite pattern isn’t on the list do let me know in the comments. Most of the photo’s in this post are the official pattern photo’s, which I’m assuming designers will be happy for me to share as it’s basically free advertising for them (if not, and they’re yours, let me know and I’ll take them down). The rest of the photo’s are my own. It should be fairly obvious which is which. This entry was posted in Uncategorized and tagged along, jean, jeans, make, pattern, sew, sew a long, thanksgiving. Bookmark the permalink. I’m considering trying a new style with the Morgan Boyfriend jeans….. I want to make them all. Actually, it’s more like, I want them all made for me. I think you should cut out two pair with two different patterns. That will make it a bit easier to choose! Real Deal Jeans from Winter Wear Designs are not on your list but I’ve made some really cute jean shorts from them. Pingback: Birds of A Kettle | Jeans? Those foxy jeans are really cute! Looking forward to seeing more posts! Ah jeans! I have spent years trying to perfect the fit of mine, so will watch your progress with great interest. I have made jeans that I like, but I need to make a pair that last more than a year! Or enough pairs so that they get enough days off to last more than a year!